The last two weeks have been marked by a run of storms in the Atlantic that have brought very high winds and seemingly endless rainfall. At first we worried about the weather’s impacts on the land with widescale flooding in southern England. How would landbirds find enough food if the ground became saturated and the rain prevented them from foraging. Even our garden birds were suffering. At the same time our coasts were being battered with high winds and huge waves. As defences were being breached, seawater was coming inland and would impact on plant communities and eventually their associated birds. Then, last week we started to see exactly what the storms were also doing to our seabird populations. North-west Europe has many millions of seabirds and the majority of these winter out in the Atlantic. We could only guess what it must be like out there for small birds that need to be able to dive for fish in roaring seas and winds up to 100 mph. 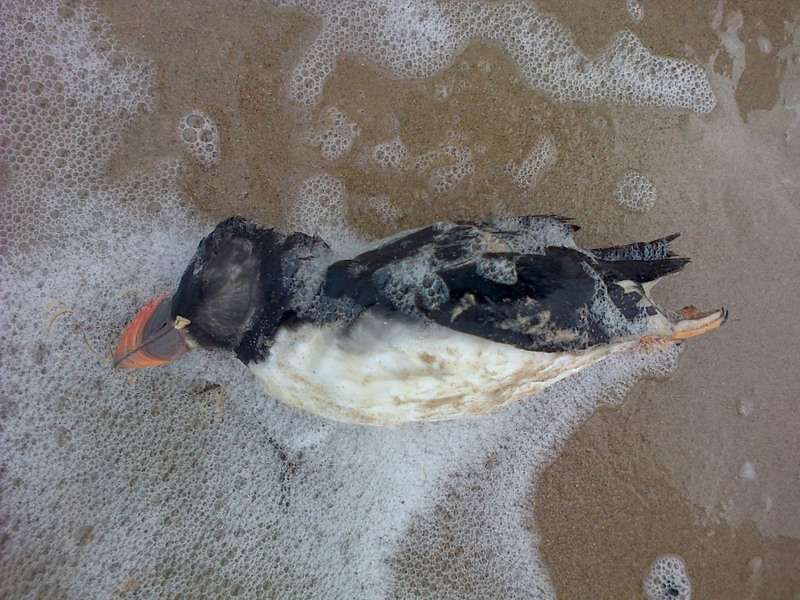 Well, our worst guesses began to come true when dead seabirds started to turn up on beaches from the Bay of Biscay and Brittany to Cornwall last week. The predominantly south-west winds have put the victims on our islands’ southern and western beaches. 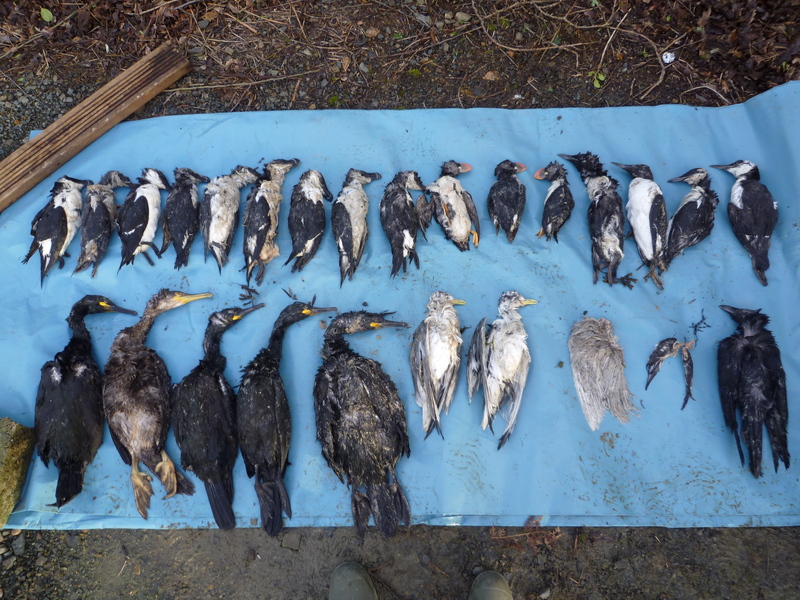 In the last week we have seen over 75 dead birds in Jersey including shags, kittiwakes and auks. 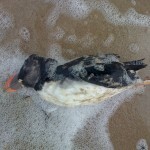 The presence of many dead puffins has, perhaps, caused the most upset. Local puffin populations are both popular and highly threatened and, while the origins of the victims is not really known (to date one bird is known to be of Welsh origin), it brings home just how vulnerable our local birds are. It might now only take one big storm to exterminate them. Alderney Wildlife Trust are co-ordinating attempts to record the numbers of birds that are being found in the Islands. Sadly it seems most are being found in Jersey. The Jersey Wildlife Facebook group are posting records as people find birds. Cris Sellarés is organising a systematic count on Sunday (16th February) in the afternoon and will check all the beaches. If you’d like to join you can make contact through the Facebook group. After Sunday’s count please continue to look for birds The important things to do are to record the species, location and date and then try to dispose of the body (this prevents the same bird being counted several times) – bury it on the beach above the high tide line or bag it and bin it. Look for any rings or tags etc. though. Please wear gloves if you do pick up a bird and always wash your hands thoroughly later. You can then report your finds through the Facebook group or directly to Birds On The Edge and they will be passed on. This entry was posted in Bird monitoring, Blog, Events, Top News by Glyn Young. Bookmark the permalink.